Are Your Kids Negatively Impacted By Their Screen Media Use? Watching TV and listening to music are the top two activities for both tweens and teens. Primarily kids are absorbing the messages and music created by others. Only 3% of their time is spent on content creation. Boys and girls differ in their media use. Teen boys average 56 minutes per day playing video games compared to teen girls who average 7 minutes per day. Teen girls are more interested in social media spending about 40 minutes more a day on average than boys. 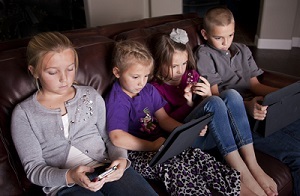 Clearly digital media, from old fashioned TVs to iPhones and iPods, plays a significant role in our kids’ lives. How do you know if your kids are being negatively impacted by their screen media use? One area of concern is around what your children are doing when they are using media. When you do not monitor what your kids are watching or doing online, you are unable to provide guidance. The possibility of your kids engaging in inappropriate media activities increases when they are with their friends. What are your policies around digital devices when friends are over? Do you allow kids to keep their digital devices when they are at your house for a sleepover? How do you monitor what they are doing? Discuss your rules ahead of time with your own children so they know what to expect and what will happen if the rules are broken. Kids love screens. So why does the American Academy of Pediatrics recommend limiting entertainment screen time for children and teens? Excessive screen time interferes with social, emotional, and physical development. If your child exhibits some of the signs below, it’s time to put some limits on screen time. When you realize your children's media usage is having a negative impact, you need to set some limits. Discuss with your kids what limits are reasonable and how your family plans to enforce those limits. Preventing problems in the first place is far easier than fixing them later on. If you’re struggling to set healthy limits, learn how to do it in Priceless Parenting’s online parenting classes or get help through personal coaching.